44 km south of Badrinath is situated the town of Joshimath, the winter home of Lord BadriVishal, where we made a brief stop on our way down towards Rishikesh to pay obeisance in some of the temples the place is known for. 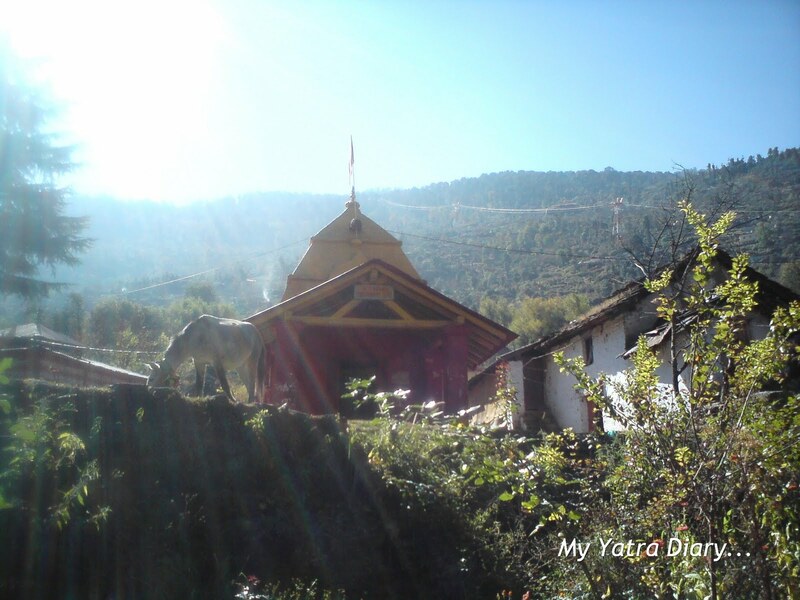 A short climb up from the parking lot is Jyotirmath; the seat of learning, a monastery and theological college that Adi Shankaracharya (the founder of the Advaita Vedanta school of philosophy) had established many centuries ago. It’s after ‘Jyotirmath’ that the place eventually got its present name ‘Joshimath’. A few steps up from the Jyotirmath, is the ancient tree Amar Kalpavriksha and Adi Shankaracharya’s Tapasthali Sphatik Shivling Gufa also known as the Jyoteshwar Mahadeo Temple. At the tender age of 11, Adi Shankaracharya had come to Badrikaranya (Badrinath jungle) for performing penance. After performing penance for 5 years, he saw the light (vision) under a tree which is today known as ‘Amar Kalpavriksha’. 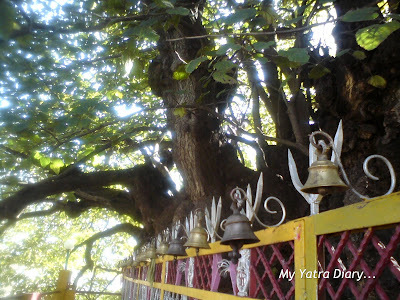 There is a cave near the tree where it’s believed that Adi Shankaracharya used to catch up on some rest. Inside the cave, there is a crystal (sphatik) Shivlingam brought by Adi Shankaracharya himself from Kailash. 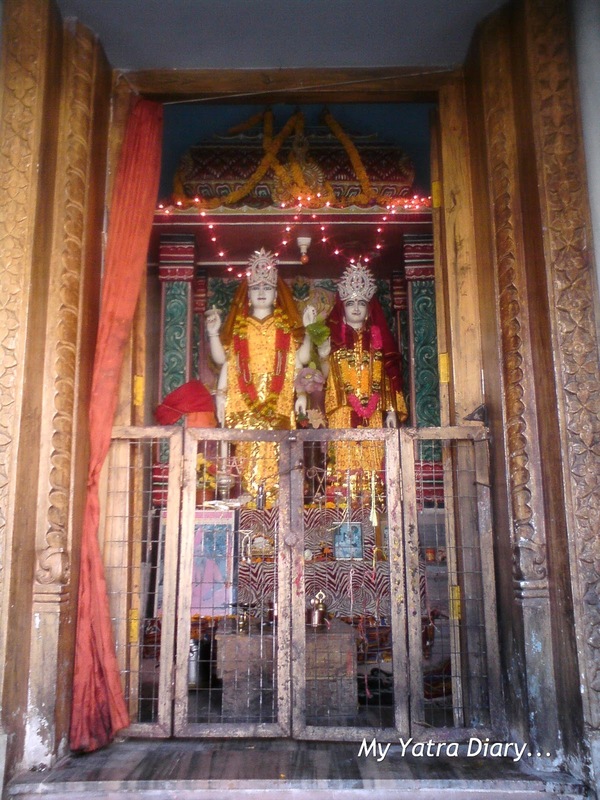 Around the same time while he was absorbed in penance, the Badrinath temple was destroyed and the Badrinarayan idol was thrown in the Narad kund. 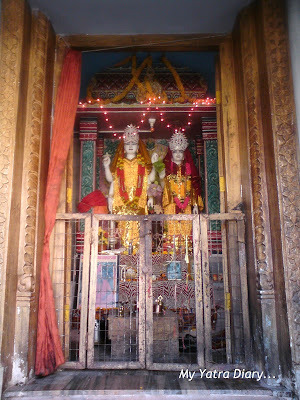 Adi Shankaracharya not only repaired the damaged temple and restored the idol in the temple but also went on to establish the first of the four maths – Jyotirmath (described above) also known as Joshimath. 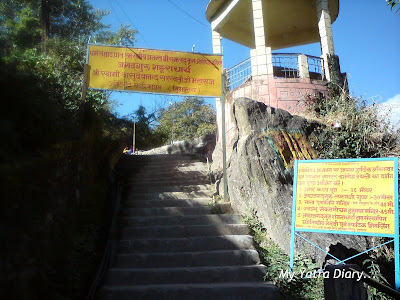 Climbing further up, one comes across the Purnagiri Mata temple and Syambhu Sankatmochan Hanuman Temple dedicated to Goddess Durga and the devotee of Lord Rama, Lord Hanuman respectively. Apart from these well known temples, there was one more temple - the Bhavishya Kedar Temple, which we came across while making our way back towards the parking area. Though the Bhavishya Badri temple is quite well heard of (described below) but not much information is available on the Bhavishya Kedar. 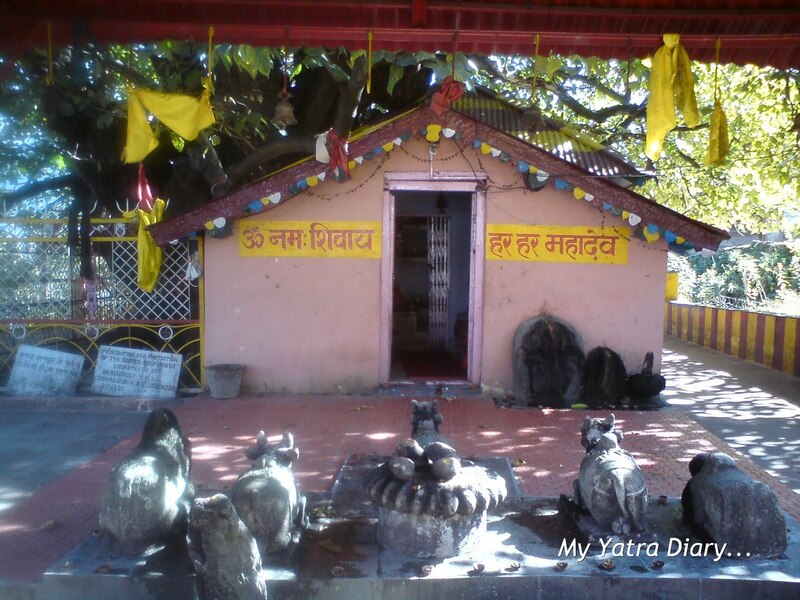 Bhavishya Kedar dedicated to Lord Shiva..
About 15 km from Joshimath, is the the Narsimha Temple, the winter home of Lord BadriVishal, where devotees throng to worship the Lord when the Badrinath Temple is closed in winter. The temple is about 1200 years old. Dedicated to Lord Vishnu, the presiding deity of the temple is Narsimha, the half-man-half-lion fourth incarnation of Lord Vishnu. 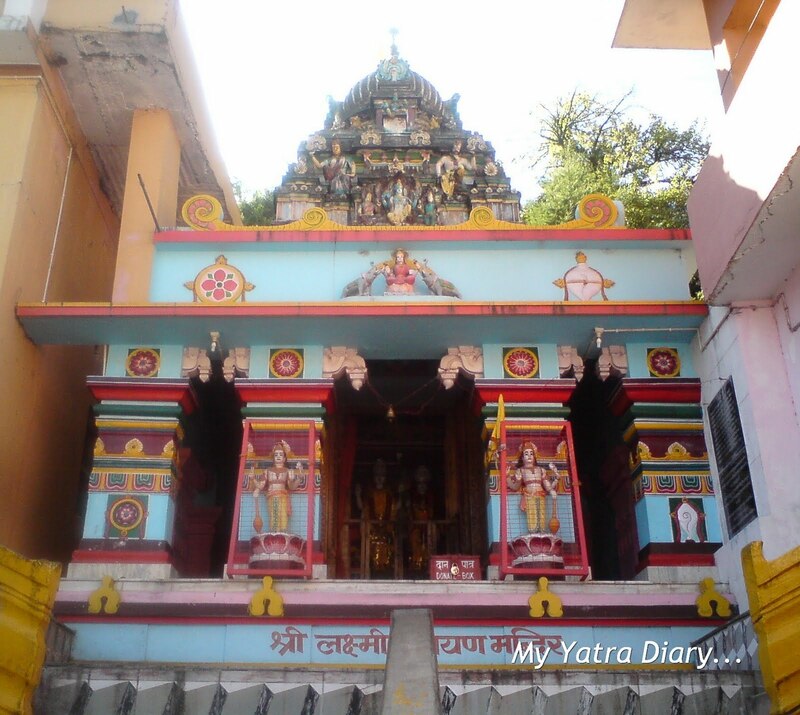 The Narsimha temple also has a very fascinating tale to share. The left wrist of black stoned idol of Lord Vishnu’s lion-man avatar is said to be getting thinner with each passing day. It is believed that a day will come when this wrist will fall off and the Nar-Narayan mountains ahead of Vishnu Prayag will fuse together blocking the way to Badrinath forever. From that day onwards, the Lord will have a new home at Bhavishya Badri. One has to trek beyond Tapovan up the Dhauliganga River to reach this holy spot. 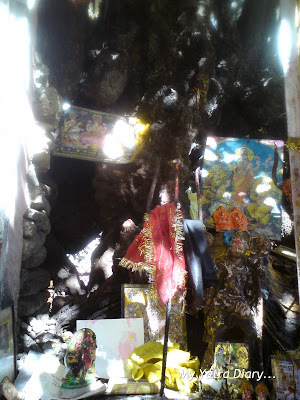 Another sacred shrine in Joshimath is the ancient Vasudev temple, which the Vaishanavas consider as one among the 108 divya desams, the most sacred Vishnu shrines. It is also noted for housing an idol of a dancing Ganesha, one of only two such idols venerated in any temple in the country. 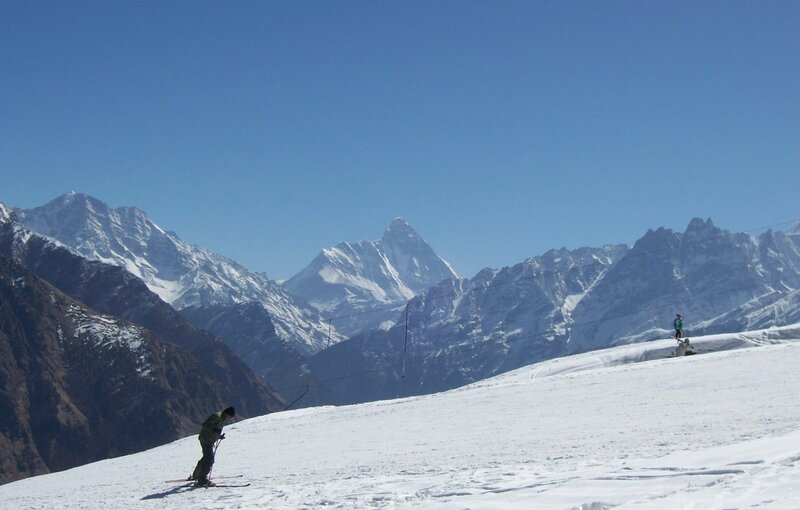 Auli is popular for adventure sports like skiing and paragliding affording impressive picturesque panoramas of the massive Himalayan peaks like Nanda Devi, Kamet, Mana Parvat and Dunagiri. Auli is the end point of the Asia’s highest and longest trolley which originates from Joshimath. 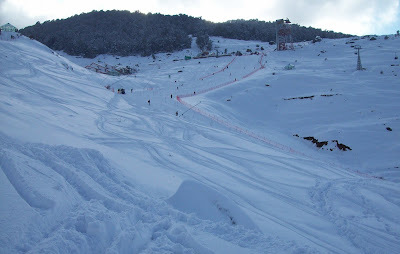 Auli is a perfect destination for skiers in winters (Dec-Feb) as one can enjoy the heavy snowfall that the region recieves during this period. Auli is a 13 km drive from Joshimath or one can also trek for a distance of 5 km to reach there. Another exciting option is the 4 km long ropeway connecting the two towns. How striking are the blues of that temple? And as for that tree - 2500 years old? Amazing. I enjoyed the wonderful virtual tour.. Incredible post..! Sigh.. I don't know how long my wait for visiting Bhadri will last..! Till then your posts are my relief..! A beautiful and divine post as usual :-) Loved it! I love the colors of India and I like the first two photographs especially. informative as always....nice snaps...I have plans to go to Auli and ride the ropeway..
Love that ancient tree with offerings - so beautiful Arti! Hope your weekend is lovely! i have posted the answers to puzzle. Another fascinating visit to your part of the world through your fantastic captures, Arti, along with the information about them that you provide! Delightful! I do look forward to your posts! Hope your weekend is going well! Beautiful view .....Love the temples...The place look so peaceful.. Else rules might have changed! I am sure you are now preparing for another great trip. Go to Kumaon in Nov, Dec. Very nice concluding chapter. I just got one chance to stay over night at Joshimath and visit Narshima temple only. Now I am tempted to take a break on my way up to Badri. Lot to see. It may be that the Bhabisya kedar is a recent local addition. Let me read the yatra once more from day 1. Have a nice day and a simple but hearty " THANK YOU"
I always enjoy following your trip! The temple in the first photo is very beautiful!The color looks something special! I hope you will have a fabulous day! I think I've never seen a tree that old!! The row of bells is so pretty and charming! Do you ever get short of breath in all that height so high, maybe you are used to it? Do visitors need oxygen? And I am not used to such cold, I live in Mumbai where the minimum temperature even during the winter is about 20 degrees!!! Nice one, arti! I remember Joshimath from my earlier visit.. in fact, the spatik shivling has been one of the lasting memories.... and when i told someone who had returned from there recently, they said there wasnt anything like that!! so your post makes me feel much better... that it wasnt a figment of my imagination, but a real memory!! however, your pics do tell me that the place has changed so much in the last 20 years!!! it is almost unrecognizable!! i remember the priest had taken up the spatik lingam and showed us how the light reflected so perfectly that it appeared as if the light was within the ling? in fact, i remember thinking that this was what would have been meant by 'jyotirling'! thanks for bringing back some wonderful memories! Another fabulous account of your adventures! Hi Arti. You must really feel on top of the world amongst all those mountains! Fantastic photos as usual. 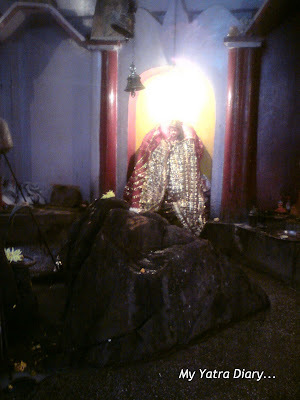 I especially like your photo of the Purnagiri Mata Temple -- the way the light falls on it, it really does look like it has some sort of heavenly connection! 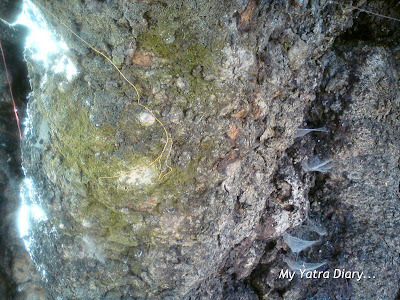 The tree older than 2500-year-old to be estimated is awe-inspiring: no wonder it is worshipped for its divinity. Did you feel divine aura from it? Not only temples but also Auli fascinates me, either of them has distinctive color, touch and character. Keep healthy and happy, Arti. You have the skislope in the high spot and You can see the Himalaya Mountain while you are skiing. So gorgeous! I was surprised to know the tree living for 2500 years. Thank you for sharing nice spot. I truly look forward to these beautiful accounts of your travels. 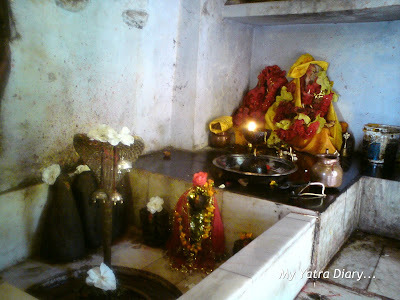 I especially like the photo of Jyotirmath - it's so colorful. and the tree - WOW! I'm wishing you a happy Friendship Day too Arti! this is the first I've learned of it and I think it's a wonderful recognition of friendships. happy Sunday to you. Those last 2 photos remind me of CO, Arti. Have you ever skied? It doesn't look crowded at all at the Laxmi Narayan Temple. Even the trees are ancient in India! And things do change with time, they were definitely little different from when I visited 16 years ago!!! One definitely feels an divine aura and sense of peace when travelling to places where people of great knowledge have set foot... You just have to be calm yourself to feel the presence of it... I do feel that something when I visit these places. Hope to go there next time I am at Badrinath. great post and nice captures . You are kind of tempting me start a journey to visit holy places...I love your pictures as much as the blogs. a 2500-year old tree? amazing! your posts endear me to your country, arti. thank you. I wish the Bhavishya Badri does not come into existence during our lifetime :) definitely we would not want such a calamity to happen! This place looks to have various historical meanings. The various historical things and thought made the architecture and town. There is a key to think about a town. Anyway I could enjoy your trip every post.Thank you for sharing. beautiful and extremely divine...:) superliked the post Arti..
Beautiful colors in that lovely temple -- and I can't get over the age of that tree. I like the little resting place away from the rest of the temple. I guess even Holy people needed sometimes to get away for a rest! nicely documented and the light falling on the temple gives it nice effect! Hi Arti, how r u ?...lovely photography ..love the detailed post as always...u capture it so beautifully that u make me have a visual tour whenever I visit you...keep up the good work...U too have a lovely week ahead! Yes, I hope we never see that happening during our lifetime. So glad to hear from you both after a considerable time... Miss your presence here often. What a beautiful post, so full of interesting information and pictures. I always like all the information you give. Absolutely stunning, Arti, and thank you for causing me nostalgia once again...I've had an out of this world spiritual experience at Joshimath(..nothing to do with Hinduism). Your post is a treasure! You find time to travel so much... or an accumulation of all your travels? hey AArti,.. hope you ok... thanks for sharing such wonderful journey... really love coming here and reading... kp the great work going..
good stuff Arti.. Need information like this to keep my children and hubby grounded to India and culture and our annual indis visits. Your trips are incredible and images do the justice. joshimath and auli are two places i want to visit in uttarakhand!! I had gone to joshimath when i was a little kid, so dont remember much about it. Just a quick note to say I enjoyed this post, Arti. The info and the pics are all terribly tempting, as usual. Wonderful post. Those sking treks are breathtaking. Wonder when i'll get to see it all. Sigh!